7.30 pm at Greasley Miners Welfare, Dovecote Road. Obviously, our dates depend on the availability of the room and we know that we may also be required to change a provisionally booked date if the Miners’ Welfare have a better offer, but I have been trying to book the 3rd Friday of the month, where possible. We have covered a variety of eras/genres including the 60s, 70s, Musicals and Abba. Anyone who enjoys singing at whatever level is welcome. 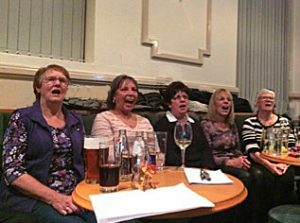 On Friday 16th November, a smaller than average, but highly enthusiastic band of songsters met up at Greasley Miners Welfare for our second meeting of the season. As usual, the evening went with a swing. Members chose many old favourites, mainly from the 60s and 70s, including numbers by The Searchers, Sonny and Cher, The Beatles, Dusty Springfield etc., and sang them with great gusto!